Can the Bank of England resolve the banking crisis? 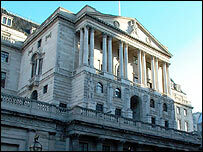 The US sub-prime loan crisis may push up mortgage rates in the UK, a former Bank of England adviser has warned. Professor Willem Buiter, an ex-member of the Monetary Policy Committee, said UK banks were in crisis over their exposure to bad loans in the US. He said this had made them reluctant to lend to each other, which had raised interbank lending rates. The banks were in a state of "fear and loathing" that could increase standard mortgage rates as well, he added. Some banks are worried that their rivals may not have revealed multi-million pound losses on sub-prime mortgages in the US. As a result, they are currently lending to each other in the interbank money markets at an interest rate of nearly 6.9%. That is significantly higher than the standard bank rate of 5.75%, which the Bank of England kept unchanged after its monthly MPC meeting this week. Professor Buiter told the BBC's Today programme: "The extent to which this translates into higher rates being charged to households and mortgages or hire purchase loans or higher loans to businesses in the real economy, that, I think, is an open question. "The longer it lasts, the more likely it is that all rates from deposit rates to mortgage rates to loan rates will, ultimately, in the private sector get pulled up to that level," he added. The current liquidity problems in the banking system have driven up interbank lending rates sharply in the past few weeks. Professor Buiter said: "It is a new type of crisis - it is not an old fashioned banking crisis. We don't know how long it is going to last. "Gradually clarity will dawn, but how long it will take, it could be weeks, it could be a few months." Evidence that these higher interbank rates are now starting to affect financial deals offered to the public has come from several lenders. This week, five lenders - the Anglo Irish bank, Northern Rock, Heritable bank and the Derbyshire and West Bromwich building societies - have each offered new fixed-rate savings deals, but at rates up to 0.55% higher than before. For instance, the Anglo-Irish bank is now offering to pay savers 6.9% if they lock money away for one year. "It is unusual to see rate rises that are not triggered by increases in base rate," said Andrew Hagger of the financial information service Moneyfacts. "However, with money markets in a volatile state on the back of the US sub-prime mortgage crisis, it is not surprising to see savings rates being increased, in an attempt to bring funds in via their front doors, rather than resorting to traditional methods." So far, though, the higher cost of borrowing in the wholesale money markets has not filtered through to mortgages, apart from those offered to people with poor credit histories. This may change, said Ray Boulger of the mortgage brokers John Charcol. "If the current Bank Rate/Libor spread prevails for much longer, we may see some lenders increasing the cost of their Bank Rate tracker mortgages, and mortgages offering a discount off their standard variable rate."